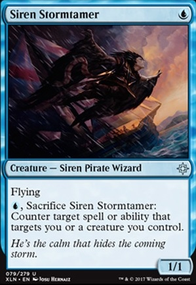 I plan on using my 1-drop Duskborne Skymarcher in the beginning, 2-drops Martyr of Dusk or more Duskborne Skymarchers, and saving up enough mana so that I can counterspell with Negate or especially Essence Capture which would give me time to gather more Lands and give +1/+1 to whoever needs it. Then hopefully I will be able to cast, most of all Benalish Marshal , or Radiant Destiny which would be somewhat helpful as long as I still have some Vampires on the field, or Queen's Commission or even Squire's Devotion . 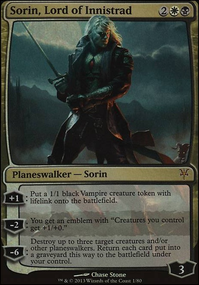 As long as I have some 1/1 Vampires with Lifelink, I'll be able to block enemy creatures without trample for some life and more time for Lands. 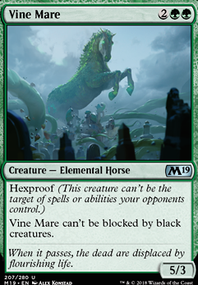 The main problem I have is Mana cost, as most of my cards are 3 and 4 drops: Unbreakable Formation , Sanguine Glorifier , Benalish Marshal , Radiant Destiny , Squire's Devotion , Mavren Fein, Dusk Apostle , Queen's Commission . I'll have to change my deck entirely in order to make a better Azorius Deck as those are my main White Vampire cards to choose from. I think it would be a good idea to up the cards that generate vampires. Stuff like Legion's Landing Flip, more Squire's Devotion , and Queen's Commission . If this was my deck, I would be running Esper (Blue/Black/white) as you have more options for control. 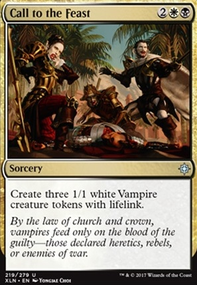 Also if you just keep it Azorious, focus on the tribal aspect of these cards, since the focus is on vampires. It's an infinite damage combo. Equip Famished Paladin with Sorcerer's Wand . Paladin taps to deal 1 damage to opponent (the wand gives him the ability, but it is the paladin that does the damage.) With lifelink, he untaps. repeat, repeat, until the opponent is dead. Thanks for the comment! To answer your question, I run Healer's Hawk because my first goal is to gain a comfortable amount of life, then combo off or win with attacking. The first version of this deck primarily focused on combo ex: I had four Forerunner of the Legion and four Sorcerer's Wand. That deck didn't really work bc I died to aggro, control and occasionally midrange decks. Since the deck mainly focused on the combo instead of any other plan, if I couldn't get the combo (which was often) I lost. With this deck I have won through aggro and combo! You are correct that Sorcerer's Wand is important but unlike the other combo pieces eg. 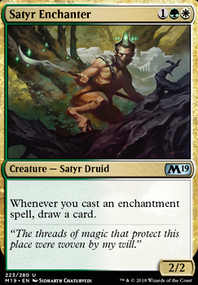 Famished Paladin, Squire's Devotion, and On Serra's Wings, it can only really be used combo instead of being used to power up a creature. Forerunner of the Legion is also a nice card but is kind of clunky. I have one in the main deck as a last hope if I really need a Famished Paladin. 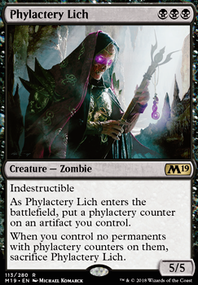 Orzhov is coming up though and when that comes out, I may have to see what additions I add! Would you consider a Reliquary Tower, since you say you've ended up having to discard due to hand size issues. You are no longer using Squire's Devotion and are using On Serra's Wings, I'd feel that you could make use of Blackblade Reforged possibly. I guess I have to cutout Forebear's Blade and 1-2 other cards for just some copies of Deafening Clarion and Lava Coil. Got sometimes troubles against decks which flod the board with to many tokens. 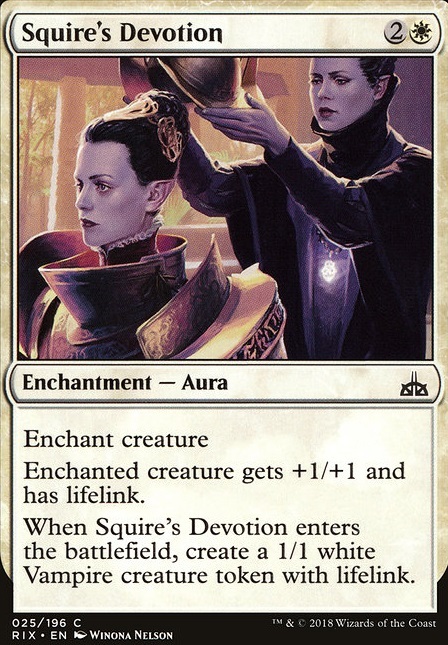 Also, would you suggest to replace Squire's Devotion with On Serra's Wings at least for 1-2?